One of the best ways of showing our love to those we cannot visit is by sending them a carefully chosen gift, especially when Christmas is lurking around the corner or someone is celebrating a birthday. At Eurosender, we know very well that in such cases, a reliable, as well as timely delivery, is crucial in ensuring the perfect surprise. It is for this reason that we only work together with the most renowned international courier companies and are committed to the highest standard of services. Your only task when booking the shipping of gifts through us is to ensure your shipment is well prepared for transport. Our tips on how to pack gifts for shipping will help you do just that. How to book courier services for shipping gifts? Get informed on how to pack gifts for shipping. Our booking engine will automatically choose the best as well as the most affordable shipping option for your chosen route while our agents will arrange the transport and communicate with the couriers in your name. This means that you will be able to invest your hard-earned money in the gifts itself and not in their transportation while still enjoying all the benefits of door-to-door delivery. If you need even more information on how to ship gifts abroad or how to pack them, simply turn to our friendly and dedicated customer support agents. They will be happy to provide additional tips and guide you through the booking process. When sending larger gifts, make sure you measure your package before booking the shipping. Use the Shipment Size Checker to quickly determine which type of service is most suitable for you. Besides package, pallet and freight shipments, individual offers are also a possibility. If you want to send a gift from Poland, Spain or Sweden or use the “First possible pick-up time” service, never forget to print out the label and attach it to your shipment. This is done by couriers in all other European countries (in case of package shipments). If you plan to leave the pick-up address shortly before the pick-up, make sure you place an order at least two working days ahead of your departure to avoid any issues. Never forget to book the delivery well in advance during the holiday season as the couriers are under immense pressure during these periods, which can lead to delays. You can also read our dedicated blog article on sending Christmas gifts abroad for more information on the matter. Before packing and sending a package away, always check whether a gift you have chosen it is not on the list of items that are not recommended for shipping or even forbidden. Pay special attention to items with lithium-ion batteries (can only be transported by road), different fluids such as perfumes, and food products (avoid perishable items). If you are not completely sure if your gift is suitable for standard shipping, contact our customer support specialists for more information. While the basic insurance is already included in the price of every shipment booked on our platform, we recommend that customers sending more expensive items also opt for extra insurance packages. Additional insurance of up to 1000€ or 2000€ (or even more) is available at extremely low rates, especially when one considers the piece of mind they bring to the shipper. The best packaging materials for presents? Cardboard boxes – depending on the nature of the items (fragile or not etc. ), you can either pack your shipment in one box or use the double-packing method and place one box in a slightly bigger box for extra protection. However, every box you choose has to be strong enough to withstand the transport, which means no tears, holes or dents should be present. Used boxes from the supermarkets are suitable as long as they are in good condition. Before shipping particularly fragile items, make sure you also read our instructions for sending such materials. Bubble wrap or packing paper – to protect most materials before placing them in the box. Packing materials – these will act as internal cushioning for your items. Use bubble wrap, packing peanuts (polystyrene chips), styrofoam sheets, old newspaper or foam. Adhesive tape and scissors – to seal the package when you are finished with packing. Wrap items or their packaging in bubble wrap. Use several layers of bubble wrap to completely cover every individual item in your package. If you have a new product in its original packaging, just leave it like this and wrap the box instead. To pack more fragile items, use the double-box technique and put the items in a smaller box before packing them in the chosen carton. You can even use three or more boxes for an even safer transport. This is a particularly great option if the original packaging is part of the present and needs to be protected. Take care of internal cushioning. Use ample amounts of packing materials. Cover the bottom part of the box with foam, crumpled newspaper, packing peanuts or a similar item before packing the items or boxes. Once these are placed inside the box, fill all empty spaces with additional packing materials. Make sure there are no empty spaces in the package. Check if everything is safely packed and seal well. After everything is packed, gently shake the package to see if anything can still move inside. If everything stays in place, close the box and apply adhesive tape along all the seams of the carton. Bear in mind that items with lithium-ion batteries can only be transported by road. This means that for international shipments to and from Greece arranged through Eurosender, courier services will not transport these batteries or any type of electronic device with these inside. Leave the lithium-ion batteries inside the devices and make sure you secure the switches in a way that will prevent the items from being turned on by mistake. When sending items with AAA batteries, it is advisable to take them out and pack them separately. For more info, read our instructions for shipping a laptop, a tablet, a smartphone, a television or an e-cigarette. Do not send anything perishable as it may spoil en route (raw meat, fresh cheese, freshly cooked dishes etc.). No ice or ice bags. Wrap the items in plastic foil to neutralize the smells if needed. For more info, check out our dedicated blog post on shipping food as well as our tips for sending olive oil and food supplements. Loosen the strings on stringed instruments. Use an original case for your instrument together with a cardboard box to ensure maximum protection. Visit our special pages for shipping a piano or a guitar for specific information. Wrap the books in packing paper or bubble wrap. Pack hardcovers in a standing position (spine to spine) or stack them vertically. Softcovers should be stacked flat to avoid damage. Find more info on our page dedicated to shipping books. Always fold them and put them in a padded envelope or a plastic bag before placing them in a box. Secure detachable belts, buttons or other embellishments with bubble wrap and tape to prevent them from moving about. Make sure to also check out our page for shipping clothes. Secure the lids on board game boxes with adhesive tape. Leave new toys, vintage pieces, and other valuable items in their original boxes and wrap these in bubble wrap. Use the double-box packing technique. Secure switches on toys with lithium-ion batteries, remove AAA or AA batteries from items that have them. Take bigger items apart if you can and wrap them separately. Additional tips are available on a special page. Always try to use an original box (or a box of similar size) together with a sturdy larger one (never just the original packaging, though). Ample amounts of packing materials are a must. For more advice on international watch shipping, visit our dedicated page. Use the bubble wrap liberally and cover every item completely. Cushion the inner walls of the box with Styrofoam sheets. Use cardboard dividers for bottles. Use several cardboard boxes for extra layers of protection. For more info, also visit this page. Visit our pages on shipping furniture, outdoor furniture, piano etc. to learn more. Eurosender has already helped numerous customers to ship gifts via courier companies without issues. We have successfully proven that sending presents abroad is possible without breaking the bank or stressing the shippers out. 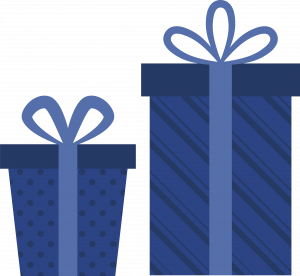 Let us show you how easy it is to ship a birthday gift internationally or play Santa by using our platform. Transport services for almost any item. If you cannot transport a gift to the recipient yourself, our help is only a few clicks away. Book package, pallet or even an LTL shipping and do not let the dimensions of your gift spoil the perfect surprise. Ship everywhere. By taking advantage of a vast network of reliable partners and covering all of Europe, places, where you cannot ship through us, are few and far between. Full support. We do not only offer the cheapest way to send gifts to your loved ones but also tips and guidance for customers with less experience in shipping. Flexibility. Ship numerous boxes together to one address or to several recipients. Ideal for smaller companies looking for the cheapest way to send corporate gifts or busy secret Santas. Customers with special requests can also receive a tailored offer in a blink of an eye. Is there anything we have not yet told you about shipping Christmas gifts abroad or surprising your friends and family with birthday packages? Do you want to ship something else? Give us a call or write us an email and we will be happy to tell you even more about our services. Take into consideration these guidelines when shipping items as gifts. Nevertheless, please consider that following them does not guarantee that the courier company will transport your package without restriction. In case you decide to ship any of the above items or anything else as a gift, Eurosender will not be held responsible for any damages caused by the transportation of your shipment.